Reviews of antique related books and other antique and collectable items. It’s harder than you might think to produce a unique and useful reference guide, but I believe that Ian Newton has done exactly that with his book Crown Ducal Snow Glaze. It’s an A5-size, 52-page guide to the ‘snow glaze’ pottery designs produced by Charlotte Rhead for A.G. Richardson from 1935 to 1939 and sold under the Crown Ducal Ware branding. The majority of the book is taken up with an illustrated guide to all known snow glaze patterns. These are listed in numerical order, and each pattern is illustrated — where the author was unable to find a photo, he has digitally recreated the pattern for collectors to use as a guide. Unlike some books of this type, Crown Ducal Snow Glaze is printed on high quality glossy paper, is well laid out, and the photos are sharp and accurately reproduced, making them a pleasure to browse. For anyone who collects or trades in Charlotte Rhead’s snow glaze designs, this book is an essential reference guide and well worth the modest purchase price. Highly recommended. For more information or to buy a copy of Crown Ducal Snow Glaze, visit www.rhead-crownducal.info. This entry was posted in Reviews and tagged A.G. Richardson, Charlotte Rhead, Crown Ducal, Ian Newton, snow glaze on April 11, 2013 by Perfect Pieces. Backstamps are an essential aid to dating and identifying antique and collectable ceramics — but finding reliable and detailed information on pottery backstamps is often a challenge for both collectors and dealers. Even in this digital age, books remain the best way to find this information and for Crown Devon collectors, one such book is The Backstamps of Fielding’s Crown Devon. 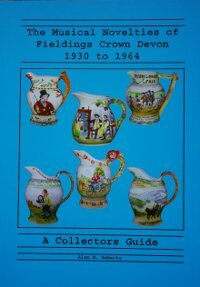 This is a 30-page pamphlet written by long-time Fielding’s collector Alan Roberts, and published by the Fielding’s Crown Devon Collectors’ Club. As the title suggests, The Backstamps is devoted solely to backstamps and is an excellent reference guide for anyone wanting to know about Fielding’s backstamps in comprehensive detail. Alan discusses the backstamps in considerable detail as well as providing many pictures of the different marks used. This book covers a wider range of Crown Devon marks than Godden’s Encylopedia of British Pottery and Porcelain Marks and includes a few that are not included in Susan Hill’s most excellent Crown Devon: The History of S. Fielding & Co.. The Backstamps of Fielding’s Crown Devon is also very affordable, at just £3.50 including free UK postage. This really is a bargain for the amount of information provided and for anyone who is only interested in Crown Devon, it makes a far more sensible purchase than Godden’s £30+ encyclopaedia. Usefully, this book also covers the backstamps used on new Crown Devon pottery, which is not Fielding’s but is sometimes sold as such — whether deliberately or due to the seller’s ignorance. This entry was posted in Reviews and tagged Alan H. Roberts, Alan Roberts, book review, books, Crown Devon backstamps, The Backstamps of Fielding's Crown Devon on October 11, 2012 by Perfect Pieces. Despite the growth of the internet, good quality information about antiques and collectables remains in restricted supply online. There is certainly nothing on the internet that can compare with the quality and depth of information in Susan Hill’s book Crown Devon: The History of S. Fielding & Co.
For anyone with a serious interest in Fielding’s Crown Devon pottery, this is an essential book. It contains a detailed history of the pottery and the people behind it, along with a comprehensive reference guide to patterns, shapes and the marks used by the pottery. The book is well illustrated with photos of all the pottery’s major ranges and best of all, it’s thoroughly researched, well written and professionally presented — attributes sadly missing from many lesser books on antiques and collectables. 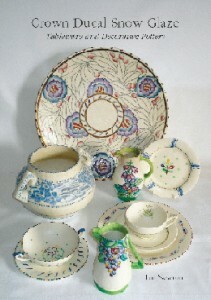 There is no better reference resource available for Crown Devon pottery – highly recommended. You can buy Crown Devon: The History of S.Fielding & Co on Amazon. Title: Crown Devon: The History Of S. Fielding & Co. This entry was posted in Reviews and tagged book reviews, Crown Devon, Fieldings Crown Devon, Jazz Publications, Susan Hill on September 25, 2012 by Perfect Pieces. British Teapots and Coffee Pots is a 40-page A5-sized guide from Shire Books, written by Steven Goss, an antique dealer, porcelain expert and teaware collector. 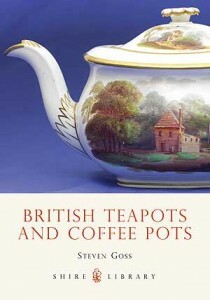 It provides a useful introduction to British teapots through the ages, although coverage of coffee pots is fairly sparse in comparison, despite the book’s title. The teapot may be in decline today but there can be no doubt that tea pots through the ages have very much mirrored wider fashions and trends in design and popular culture – something which is well-illustrated by this book. British Teapots… is generously illustrated and covers the period from the early 18th century to the present day. This book includes tips for buyers to help them spot damaged and restored teapots (and coffee pots). For £5.99 it is a useful and informative guide. This entry was posted in Reviews and tagged book reviews, British Teapots and Coffee Pots, Shire Books, Shire Livrary, Steven Goss on August 31, 2011 by Perfect Pieces. Poole Pottery is another of Shire Books A5-sized paperback books, written by Will Farmer. Will Farmer is an expert on 20th Century decorative arts and a director of Fielding’s Auctioneers in Stourbridge. His face might also be familiar to you as one of the experts on the Antiques Roadshow. This is a concise book that looks at the history of Poole Pottery from the early days of Carter & Co, through the 1950′s when Poole produced its Freeform range to the present day. The author not only talks about the pottery and its historical background, but looks at how the changing times influenced the designs that came out of the pottery. This is really nice short volume and is laid out well with colour photographs on every page. There are some really interesting pictures of early Poole pieces, including one of a wall plaque originally attached to the factory wall back in c1925. There is not any information on pottery marks or decorators’ marks; if this is what you are looking for, the definitive (and expensive) Poole book is Poole Pottery by Hayward & Atterbury . However at under £7, Will Farmer’s Poole Pottery is certainly good value if you want a readable and illustrated introduction to the history and wares of Poole Pottery. This entry was posted in Reviews and tagged books, Poole Pottery, reviews, Shire Books, Will Farmer on August 4, 2011 by Perfect Pieces. 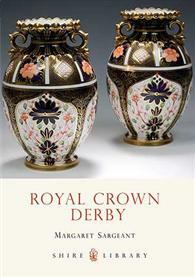 This book is written by Crown Derby expert Margaret Sargeant, who worked for the Royal Crown Derby museum for fourteen years. She has written and lectured widely on the factory and is an authority on the company. This is a concise book providing a good introduction to the history of Derby porcelain from 1750 right through to the present day. Split into three sections it covers the three main eras of Royal Crown Derby working from the Nottingham Road Factory (c1750-1848), to the King Street Factory (c1848-1935), and then on to the Osmaston Road factory (c1877 – onwards) where it remains today. Each section provides a historical guide into the porcelain factory with many interesting early photographs that are mostly in colour. An added bonus to any enthusiast is that at the end of each section is a summary of the pottery marks used by the factory at that time. Having pictures of pottery marks is especially useful when you’re trying to identify pieces and date them. This is another of Shire Books A5-sized format and is generally clear to read with photographs breaking up the pages well. It’s nice to have a concise book that not only works you through the history of a pottery but also provides you with information on the pottery marks used. For under £5 it’s certainly worth the money if you’re interested in a general introduction to Royal Crown Derby. This entry was posted in Reviews and tagged books, Derby porcelain, Margaret Sargeant, reviews, Royal Crown Derby, Shore Books on August 4, 2011 by Perfect Pieces. This review features another of Shire Books’ A5-sized books on British pottery. Ceramics of the 1950s does exactly what the title suggests and provides an introduction to the ceramics of the 1950s and to the political, cultural, economic and technical factors that were behind its development. Both tableware and decorative wares are included, although the bias is towards tableware. Author Graham McLaren is very knowledgeable and the book is easy to read and follow. The role of new technology and social changes in the designs of the 1950s is explained and plenty of examples of collectable 1950s ceramics are provided from most of the main British potteries of the time. 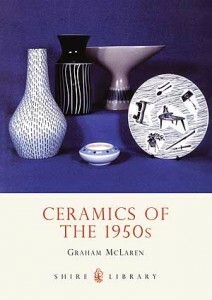 Ceramics of the 1950s is one of Shire Books’ older titles – this means that although it has had a new cover in recent years, the internal layout and presentation of the book are somewhat dated and the quality of the pictures is not as high as in newer titles. Despite this, it is clear to read, the information is good and the pictures are useful. This book is an ideal introduction to 1950s ceramics and is well worth a fiver if you would like to start learning about or collecting pottery from this era. This entry was posted in Reviews and tagged books, Ceramics of the 1950s, Graham McLaren, reviews, Shire Books on July 29, 2011 by Perfect Pieces. Until recently, if asked about Scottish Pottery, I would be forced to admit that I could not think of any except for Wemyss Ware, made by the Fife Pottery, and some later, individual studio potters. I certainly did not realise that Scotland did, at one point, have a substantial pottery industry, along the lines, if not the scale, of that which used to exist in Staffordshire, England. To my shame, names such as Buchan’s Pottery, Brittania Pottery and Bells of Glasgow were unknown to me. Scottish Pottery tells the story of the Scottish pottery industry, from its relatively late foundation in the mid-18th century through to its early 20th century decline and the consequent establishment of the large number of small, studio potteries which are dotted around this most rural of the UK’s countries. 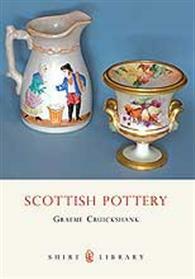 The author of Scottish Pottery is Graeme Cruickshank, an expert on Scottish pottery and former Chairman of the Scottish Pottery Society. His detailed knowledge of the subject is impressive, although the heyday of Scottish pottery production was short in comparison to English pottery, with industrial pottery production dying out in Scotland several decades before the equivalent decline of large potteries in Staffordshire began. Scottish Pottery is a useful guide to the main 18th and 19th century potteries of Scotland and also introduces some of the smaller, studio potteries that have been founded and flourished in the latter half of the 20th century. This entry was posted in Reviews and tagged book reviews, Graeme Cruickshank, Scottish Pottery, Shire Books on April 19, 2011 by Perfect Pieces. No name is more intimately linked with Arts and Crafts pottery than that of William De Morgan. His work inspired many other potters and his pottery set an example of technical and artistic excellence that was followed by other notable British art potteries, such as Martin Brothers, Ruskin, Pilkington’s Royal Lancastrian and Burmantofts. This slim volume from Shire Books tells the story of De Morgan’s life and work, from a childhood fascination with maps and drawings through to retirement and a successful second career as a novelist. The majority of the book looks at his ceramic work and the varied progress of his pottery business, and is lavishly illustrated with pictures of De Morgan’s work, which is highly-prized and scarce today. If you are interested in British art pottery from the Arts and Crafts period, then a knowledge of De Morgan and his work is almost essential. This volume makes an excellent and enjoyable start to this journey and the photos alone are well worth the book’s RRP of £6.99. 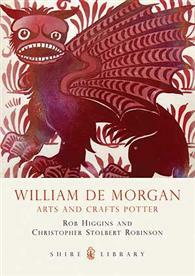 This entry was posted in Reviews and tagged Arts and Crafts, book reviews, books, Christopher Stolbert Robinson, Pottery, Rob Higgins, Shire Books, William de Morgan on April 19, 2011 by Perfect Pieces.